After the cable modem is successfully registered on the network, the Power and Internet LED indicators illuminate continuously to indicate that the modem is online and fully operational. 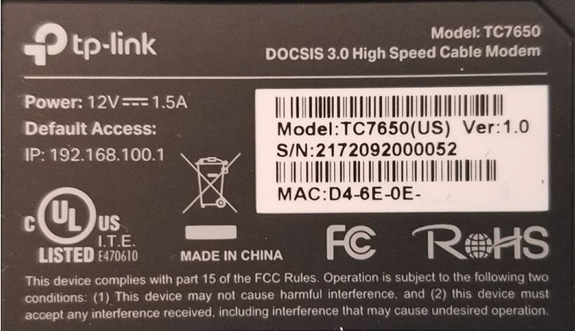 The TP-LINK TC7650 has the following ports available on the back of the modem. Reset Button - With the modem powered on, use a pin to press and hold the Reset button until all LEDs turn on momentarily, and the modem will be reset to its factory default settings. LAN Port - Through this port, you can connect the modem to your PC or an Ethernet network device. Cable Port - Connect your coaxial cable line to this port. Power - Connect the supplied power adapter to this port. On None - the modem is powered on. Off No power. Verify power supply connections and electrical outlet. Ensure the outlet is not connected to a switch. Green None - multiple downstream channels are in use. White None - one downstream channel is in use. Flashing None - scanning for downstream channels. Verify all cable connections and try resetting the modem. Off Cable modem offline. Verify all cable connections and try resetting the modem. Green None - multiple upstream channels are in use. Flashing None - scanning for an upstream channel. Verify all cable connections and try resetting the modem. Off No upstream channel are in use. Verify all cable connections and try resetting the modem. On None - the modem is online. Flashing None - scanning for configuration parameters. On None - a device is connected to the LAN port. Off No devices are detected on the LAN port. Verify all cable connections and try resetting the modem.